The Seattle Space Needle (http://www.SpaceNeedle.com) is a constant on the Seattle, Washington, skyline. During several days of sightseeing, I had opportunities to photograph it from numerous perspectives, including the views from the Observation Deck where I spent time after lunching in the Sky City revolving restaurant. To view a slideshow of other views of the Space Needle, click on the photo below. 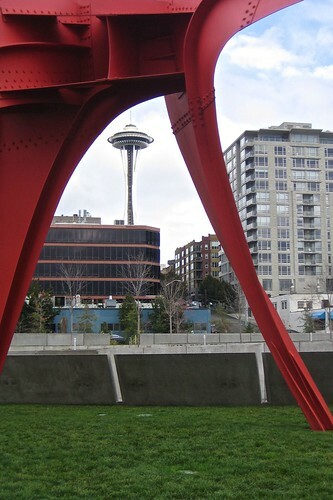 This view of the Space Needle is from under Alexander Calder’s “Eagle” in the Olympic Sculpture Park.